In a keynote speech at E3 Microsoft's Xbox chief Phil Spencer announced that the Xbox One will be able to 'natively' support a growing number of Xbox 360 games. Users of the new console will be able to play a selection of Xbox 360 titles straight away – there's 21 titles listed as initial preview titles'. Users won't be charged to play any titles they already own. Previously purchased digital Xbox 360 associated with your ID will become available automatically in your Xbox dashboard – as and when the Xbox One is updated to support them. To add games you have on disc you can simply insert the disc in the Xbox One to install it to HDD when it becomes compatible. You will need to keep these disc based games in the ODD to play them. The initial raft of supported titles, including the likes of the Banjo Kazooie games, Perfect Dark games and Mass Effect, will expand greatly over the coming months. Microsoft says that before the winter season over 100 Xbox 360 games will be supported by the new console and then "hundreds more added every month". 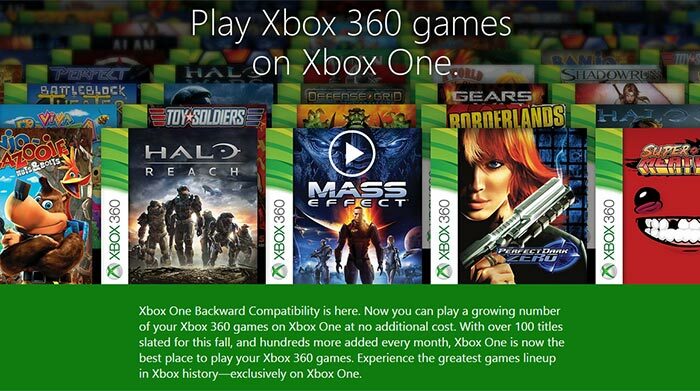 This will make the Xbox One "the best place to play your Xbox 360 games," says the firm. Why might it be better than the original console? Well, the Xbox One brings its advanced features such as Game DVR, Screenshots and Windows 10 streaming to your old Xbox 360 games and you will also be glad to know your game saves, game add-ons, achievements, and Gamerscore will be carried over. Finally you will also be able to play multiplayer with friends no matter which console they are on. Various reports say that amongst all the new announcements at E3 for new games and hardware this 'retro gaming' move by Microsoft got one of the biggest cheers from the crowd. Interestingly Eurogamer was told by Microsoft executive Kudo Tsunoda after the presentation that "at one point we thought it (Xbox 360 support) just wasn't going to be possible". Furthermore the implementation of this emulator, shown in action in the video below, doesn't require any "new code that requires work for a developer". So, considering the Xbox One is x86-based, shouldn't that mean that you could potentially play Xbox 360 games on your PC? There're still many exclusive Xbox 360 titles that never made it to the PC. The initial 20 or so titles listed have some truly baffling inclusions! If you are smart with your emulation the performance hit isn't nearly as bad as it normally is. We saw that back in the UltraHLE days. I am guessing that they are essentially doing the same, mapping graphics calls and then just emulating the CPU. The 360 had an ATI GPU in it, I would bet there is a lot of call mapping that can be done. I'm sure the emulation makes use of the fact that AMD supplied the graphics for both the 360 and XB1, and hence at the graphical level it was easier to emulate. I think that would stop the emulation running on a PC, unless maybe you had a specific AMD GPU. The titles that are being done right now are probably those that used slightly higher level APIs, or meet a certain set of restrictions to work under emulation. Whilst it might not require developer work, it might actually make use of recompiling the original game for x86 and linking to different libraries.